Kaspersky is one of the greatest security companies in the world. Its products protect millions of computers across the world. The firm is popular not only in the world of computers. Kaspersky has launched a few security products for mobile devices. One of its most popular security application has over a 50 million active users and an unbeatable rating of 4.7. A few days back, the application was updated with new features and support for the Android Nougat OS. If you’re looking forward to installing this application, go through the review of Kaspersky security 2017. How to use Kaspersky 2017 Edition app (review)? Kaspersky is a large application. Once you install it, the app takes about 57 megabytes storage memory. If you’re running the app for the first time, Kaspersky for Android will ask you to select your country after which it fetches the End User License Agreement and KS Network Statement pages. You can go through the pages if you want. To proceed to the next step, tap on the Accept button. Now, the app will open an interface where you’ll find options to create Kaspersky account and an option to skip the account creation task. 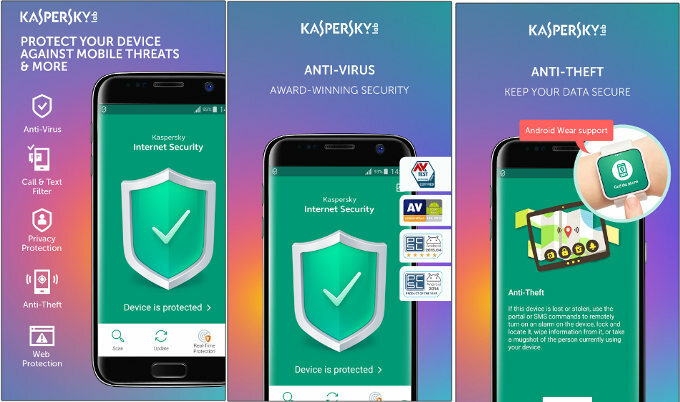 Once your Kaspersky account is ready or if you tap on the skip option, the app will prompt you to upgrade to the premium version of Kaspersky or begin using the free version. Select the desired option. Now, the Kaspersky antivirus app will display a large button. Tap on the button to run the virus and malware scanner tool. Scan the phone to find potential vulnerabilities and malicious files. A number of objects the app has scanned. Time the app has taken to complete the scanning task. Update: To make sure that the app is up to date, tap on this option to update the Antivirus and malware definitions. Real-time protection: This is a pro feature. When enabled, Kaspersky runs in the background to detect and eliminate threats. Call and text filter: This tool lets you block SMS messages and filter calls from specific phone numbers. Anti-theft: This is yet another important feature of the Kaspersky Security app for Android. You can trace your lost mobile phone with it. 360 Security app comes a similar feature. Text anti-phishing: This feature makes sure that the messages you get are free of phishing URLs. Web protection: This is a premium feature which ensures that the user doesn’t open malicious URL or pages accidentally. Privacy protection: Kaspersky Antivirus and Security application offers world class security features. The privacy protection module will ensure that your images, videos, documents are safe. Settings: This interface allows you to configure the options mentioned above. KS is a great app for mobile devices. The app’s error free and simple UI gives you access to many important tools. It has a powerful virus remover tool that will find and destroy malicious objects from your phone. KS worked flawlessly on my mobile phone. It scanned several files on the storage memory within 30 seconds. Kaspersky for Android is a powerful security application that offers several essential features. If you transfer files between mobile devices or download files from the internet, your phone will be protected if you use KS app.